* US stock futures gain. This is why those of us that are not silicon-based traders struggle in markets like this. Just kidding, I've got nothing (well, the market was up because the Fed promised to keep buying treasuries after QE2 officially ends). 1) India adding over 460 million people in the next 40 years (more than the entire population of the US in 2050). 2) Nigeria's growth from 166 million people to over 400 million. 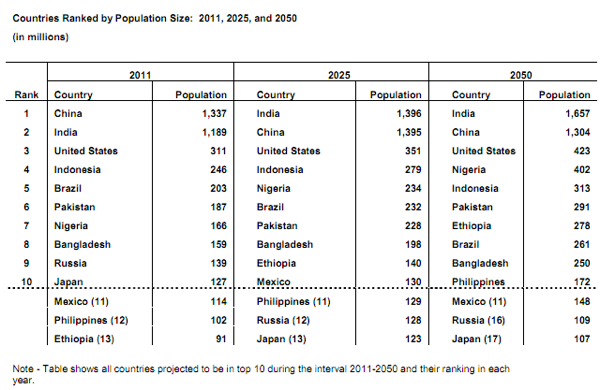 3) The growth of East Asia - India - 1.66 billion, Indonesia - 313 million, Pakistan - 291 million, and Bangladesh 250 million. 4) Russia and Japan tumbling to just over 100 million people each. Quote of the day from a Canadian news report on their negotiations with the Chinese over oil reserves: "We’re not the 51st state. It’s not the business of the United States to decide where Canada sells its resources." Whoa, someone ate their Wheaties today didn't they? "Osama al-Nujaifi, the Iraqi parliament speaker, has told Al Jazeera that the amount of Iraqi money unaccounted for by the US is $18.7bn - three times more than the reported $6.6bn. Just before departing for a visit to the US, al-Nujaifi said that he has received a report this week based on information from US and Iraqi auditors that the amount of money withdrawn from a fund from Iraqi oil proceeds, but unaccounted for, is much more than the $6.6bn reported missing last week." That $18.7 billion spread around our 53 million US school aged children would have put an extra $352 per child into our schools. The markets will have to keep its eyes on the Greek Parliament this week as they look to pass measures to ensure bailout part 5 or 6 (I've lost count at this point). This is the latest in a series of threats to the Euro but so far the coalition seems to be holding together. There is a lawsuit pending in Germany to block the bailout of Greece, but I don't expect much to come of that. I read about the Fort Calhoun, NE nuclear plant being in the flood zone about 2 weeks ago but I felt confident that the situation was under control because the plant was already in shutdown mode due to April maintenance. However, today's news that the flood waters have breached the containments may have some warming their NetJets over at the private airstrip in Omaha (wow, that's really inside baseball talk - I hope my wife gets the joke). A great compilation of jobs data was put forth this weekend looking at data since the beginning of the recession in 2007. Total jobs lost in that period 6.3 million but there have been bright spots. Industries adding jobs: Healthcare - 1.3 million; Finance/Insurance - 444k. Oil & Mining - 422k, educational svcs 295k, & government 90k. Industries losing jobs during that same period: Construction: -2.52 million, manufacturing: -2.29 million, retail/wholesale: - 1.85 million, Admin/Support: -774k, Transportation: -486k, etc. Ah, finally we're getting huge relief at the pump as oil prices have tumbled 21% in the last 6 weeks. Wait, what's that you say gas prices in NYS have only fallen by 7% from their peak 5 weeks ago? As we've discussed before gas prices seem to race upward every time there is talk of rising oil prices (even though the oil in the refineries is still lower priced oil), but when oil prices fall, gas prices tend to be EXTREMELY sticky on the downside. Well, as the world is in turmoil it's good to know that somethings remain the same - the rich still get richer. "According to the annual world wealth report by Merrill Lynch and Capgemini, the wealth of high net worth individuals reached $42.7tn in 2010, rising nearly 10% in a year and surpassing the peak of $40.7tn reached in 2007. The report also measures a category of “ultra-high net worth individuals” – those with at least $30m of free cash. The number of individuals in this super-rich bracket climbed 10% to a total of 103,000, and the total value of their investments jumped by 11.5% to $15tn, so even among the rich, the richest get richer quicker. Altogether they represent less than 1% of the world’s wealthy but they speak for 36% of total wealth." Well, the markets will be obsessed with news out of Greece today and their (no) confidence vote. This could pave the way for an eventual bailout - saddling each European household with something like 1,400 Euro of additional debt to save the Greeks (and the French, German and American banks). The impact of the turmoil in Greece (and other European countries) is starting to have an impact on economic sentiment. The German ZEW Indicator of Sentiment dropped to -5.9 in June from 13.6 in May. The Euro zone economic sentiment index fell to -9 from 3.1. Both of these levels are at their lowest levels in 2 years. Two great, but controversial ideas were proposed today in papers released by fairly smart financial minds. 1) I've mentioned Bill Gross before who, as the manager of the world's largest bond fund, is more in touch with pulse of the global economy than just about anyone I know. Mr. Gross penned an interesting letter today that strikes a chord with me as we are about to send another class of high school graduates out into the world - "Is College Worthless?" Obviously, it's a provocative title and it's hard to argue that college was worthless for the millions of people that achieved more than they could have imagined in the 70's, 80's, 90's and beyond with a college degree. However, there is some validity to the points he makes. "The past several decades have witnessed an erosion of our manufacturing base in exchange for a reliance on wealth creation via financial assets. Now, as that road approaches a dead-end cul-de-sac via interest rates that can go no lower, we are left untrained, underinvested and overindebted relative to our global competitors. The precipitating cause of our structural employment break is both internal neglect and external competition. Blame us. Blame them. There’s plenty of blame to go around." "Students, however, can no longer assume that a four year degree will be the golden ticket to a good job in a global economy that cares little for their social networking skills and more about what their labor is worth on the global marketplace." "The “golden” days are over, and it’s time our school and jobs “daze” comes to an end to be replaced by programs that do more than mimic failed establishment policies favoring Wall as opposed to Main Street." I'm not sure how to implement a new model but it is food for thought. 2) The far more disturbing paper covers the risk to our nation's pension plans if we are truly in the midst of another lost decade. Most pension funds shoot for an annualized return of 8% because that was the rough blended average return on financial assets as our country emerged from a fractured nation after the civil war to become the greatest economic force on the planet. There are concerns as to whether that rate of growth can continue as our status in the global economy is challenged from the East. Since most pensions are only earning 3-4% on their bond portfolios they have to chase aggressive returns in their equity portfolios that hopefully will yield 10% + returns. This explains why every major fund is heavily invested in Apple, Google, etc (and they are probably sweating now that both stocks are down this year). But as I've pointed out before, for all of the wild swings in the market we basically went nowhere in the 2000-2010 decade. What happens if we tread water for another decade while pension plan participants live longer than expected? Well, the ugly truth is that all pension plan employers (states, schools, etc) will have to contribute a much, much higher proportion of their budgets to make up the difference. This drains the operating budgets to fund non-operating activities and basically, the country becomes GM circa 2007. "The second major problem outlined in this paper is that pension managers, in an attempt to deal with the realities of underfunding, may be tempted to chase higher performing and riskier asset classes, and may end up compounding the underfunding problem even more through exposure to these risky asset mixes. Interestingly, according to Biggs, the targeted equity allocation does not correlate with projected return. Even worse, as shown in Exhibit 1 (above), funds using the highest return assumptions have the most underfunded pensions, a scenario that could be called, “fingers crossed and eyes closed”. Someone asked the other day a rhetorical question "Has anyone see any cool technology lately?". There are lots of downsides to the product - it's not very green (plastic cups vs. reuseable mugs), it's more expensive to operate, etc, but it's definitely cool. Well, that was quick. Yesterday, Pandora (the Internet radio company) went public at $16 and the first trades were over $24. Happy days are here again, right? Well, the stock was sold fast and furiously by flippers that didn't see a LinkedIn type pop and the stock fell to $17 and change by the end of the first day. Well, tonight I'd bet there are some bankers sweating pretty heavily as the stock broke through the ipo price of $16 and closed under $14 (currently trading $12 something in the aftermarket). When coupled with Linkedin's tumble from $120 to $70 over the past 3 weeks I'd think people might be questioning the whole Internet bubble part deux. So yesterday I said it was safe to ignore the Empire manufacturing tumble, but today's Philly Fed data was pretty ugly and it's a much better gauge of the actual economy. This was the first time the reading turned negative since last September when QE2 was leaked and the stock market was saved like a Timmy Thomas stick save. Kudos to Selfishgiving.com blog for highlighting the insanity of this current promotion from KFC. "I just can’t understand what Kentucky Fried Chicken is thinking with its latest cause marketing program. This picture says it all. Buy a HALF-GALLON of soda – with 800 calories from 56 spoonfuls of sugar – for $2.99 and a buck goes to Juvenile Diabetes Research Foundation." Whoa, the computers seemed to get their sell buttons stuck today because the market couldn't seem to come up for air today. The excuse today in most media outlets seems to be the weak NYS manufacturing number (I sound like a broken record on this subject but NY State manufacturing is such a small slice of our economy that drawing any conclusions from it - positive or negative - is a fool's game). "The future general business conditions index fell thirty points, reaching 22.5, its lowest level since early 2009." This is obviously moving in the wrong direction but I think people are overthinking this minor piece of data. The charts for the markets are pretty ugly here and one more big move down and the next stop is going to be another 8% lower. If you sleep in a tinfoil hat it's pretty easy to believe the theory that the banks are letting the market fall in the hopes of coaxing QE 3 out of the Fed. Greece and the entire European debt issue are clearly the bigger issue in my opinion (interest on greek 2 yr notes spiked over 27% today). Watch for more fireworks later this week. Just once, I'd like to see a little truth in advertising when it comes to products that continue to shrink in size while their prices remain the same. "Now get less for the same low price!" On the right is the generic brown paper bag that I had purchased last year for school lunches. On the left is the same generic brand brown paper bag purchased last week. On the surface there appears to be a slight difference in size, but when you start doing the math, the numbers are really startling. The larger bag has dimensions of 6" by 4" by 12.5". Total volume of this bag: 300 cubic inches. The smaller bas has dimensions of 5" by 3" by 11". Total volume of this bag: 165 cubic inches. That's a 45% reduction in the size of the lunch bag with no reduction in price!!! Taken another way, the total surface area of the large bag is 274 inches vs. 191 inches for the New and Improved mini-bag. A 30% reduction in the amount of product. While this was a fun exercise to work through with my kids there are implications for things like this on US economy. For example, the government considers it deflationary when the new iPad2 is launched with more memory at the same price but they often fail to recognize the subtle inflation caused by product resizing as demonstrated above. About a week ago I noted that the chart readers were nervous about the S&P 500 breaking down and that there was a fast 5% hole in the chart if we cracked those levels. Who knows what the summer will bring but we're only about 1 bad day (1.5%) from retesting the March lows. A breach of those levels could really get things headed back toward last summer's lows. I'll note however, that the pace and volume of chants for more easing from the Fed has picked up over the weekend. Any sustained drop in the stock market will force the Fed into a Sophie's Choice moment - More stimulus to pump up the market (and saddle the country with more debt) or let the market walk on it's own run the risk that it tumbles without Fed easing. This is the mantra in the markets today. Take today's market rebound which was sparked by a decline in the US trade deficit. The US sold a few more products than expected (a good thing) because our weak dollar is making our products and services cheaper to overseas customers. Conversely we imported less than expected because US consumers and businesses are spending less. It seems like a wash, but after 6 straight down days the market was ready to go up for any reason today. By the way, the last time we had 6 straight down days? Feb 2009 right before the embarked on their first round of Quantitative Easing. * Stat of the day: 30% of people with a 401k have take a loan out against it. Yikes! "Reconstruction will require a lot of money and resources, and the Diet is currently debating the need for a second supplementary budget. What is the urgency and how large should this second reconstruction budget be? Where would funding come from?" A: That's another typical Japanese way of thought. No matter how much money it takes it must be done. With all that happening you can't live in Japan. Some day we may not be able to live in Japan. but this video is pretty disturbing. Officials in Tokyo continue to argue that radiation levels in the air are fine but as this video shows the issue might be in the ground. There could be some form of natural radiation coming from the road that causes the number to spike but the maker of of the video seems pretty authentic and he has taken similar readings around his Tokyo home. The markets had their balloon popped yesterday when it appeared as though the Bernanke tipped his hand. It's clear that the Fed is painted itself into a corner and they are now stuck in no man's land. I think every astute market observer has known this for about a year but knowing it and hearing it from the voice of the Fed are completely different. I'm disturbed by rumblings from some political circles that some are considering a "brief default" of the US debt to prove some sort of political point. Anyone considering this needs to have their head examined. Someone needs to sit down and give the members of Congress a 1 hour tutorial on global markets because if they think a "brief default" will be anything but disastrous for the US they are either ignorant, anti-American or both. Finally, a little thank you to Rich at Watertown Power Equipment. I spent a good part of 2 days tearing apart my lawnmower trying to find the problem causing my engine to misfire. Rich arranged for a pick-up of my mower on a Sunday and had it back to me by Tuesday. I honestly think the mower works better today than it did the day I bought it 6 years ago :) Just amazing service at a great price!!! Consider Rich at Watertown Power Equipment for your small engine needs. Shoot me an email if you'd like Rich's contact info. So it's been a pretty rough week as the markets try to shake their Memorial Day hangover. Major sectors like tech, energy and banks weighed heavily on the markets today. We also broke through some levels that will have the Ouija board readers... I mean "technicians" freaking out. This isn't advice but it feels a little overdone here and when everyone is zigging (and everyone is clamoring for the exits right now), I like to zag. While you'll hear lots of market commentators speculating on the next move step back and look at the markets today as an objective observer. Did you know that the NASDAQ (despite it's recent 100pt drop) is basically where it was in Sept 2007 at the peak of the economic cycle? Does it feel like the economy is cranking along like it was in the midst of the housing bubble days? It may in some places (Ferrari dealerships in Greenwich for example) but I suspect the average joe is far worse off today than he was four years ago despite the relatively strong stock market performance. This won't come as a surprise to many people that are actually out in the field but according to this survey of small businesses "job creation is collapsing". "The two NFIB indicators—job openings and hiring plans—that predict the unemployment rate both fell, suggesting that the rate itself will rise. “Twelve percent (seasonally adjusted) of small-business owners reported unfilled job openings (down 2 points). Further indications of minimal future growth include the fact that in the next three months, 13 percent plan to increase employment (down 3 points), and 8 percent plan to reduce their workforce (up 2 points)." Oh FUKushima me..... Japan has now doubled the estimate of the amount of radiation that was released from Fukushima just after the earthquake. "NISA on Monday more than doubled its estimate of the radioactive material ejected into the air in the early days of the Fukushima nuclear crisis to 770,000 terabecquerels." As a point of reference - Chernobyl released 1.8 million terabecquerels. The original estimates for Fukushima were around 100,000 terabecquerels. Again, this is just the estimate of the initial radiation release, there are reports of many scary scenarios that I'll let you research on your own because I can't judge their validity. A run of the mill farm mutation (a bunny without ears) became international news today as the Japanese people began circulating the video around the web. Wow, I guess there was a reason for falling consensus. That's an ugly headline number from the BLS. The headline: +54k jobs on expectations of 165k (whisper of 125k). This is huge miss but how will the market react? Down because it appears the economy is slowing again or up because this furthers the case for more Fed easing? BTW: The Birth / Death number was +206k which doesn't boost my confidence in the BLS's data. So let's ignore the fact that basically everyone that couldn't get into the LinkedIn IPO has booked a loss at this point (the rumor is that almost all of the shares sold at $45 went to a select handful of clients) -- it's bubble on in the internet space as both Groupon and Pandora (the internet radio company) filed to go public. Pandora seems to be growing revenues (about doubled in the last year) but their costs are also exploding. Nice combination. The best quotes I saw on Groupon today included "No one that read the Groupon IPO filing would ever invest in this stock" and "More than 50% of Groupon's staff is sales. Can anyone other than Herbalife top that?". Hmm, the top five performing stocks today - Education Mgt, ITT Education, Strayer Education, Devry and Apollo Group - all have something in common. They were up 10-20% today and they all make money granting practically worthless degrees (okay, that's my opinion) to people in the FOR PROFIT EDUCATION MARKET. What would make them jump so much in a single day? Well, today the Department of Education decided that they would set a new standard for the for profit colleges. In order to keep living high off student loans financed principally by government tax dollars, these schools will need to make sure that at least 35% of their students are current on their loans. HUH? That's the bar for success? As long as only 64.9% of students default it proves the validity of your program and you can keep milking the taxpayers and students? This is the sort of nonsense that makes me head hurt. Fact of the day to ponder: Yahoo Finance reports that students at for-profit institutions represent just 12 percent of all higher education students but 46 percent of all student loan dollars in default. * The new catch phrase in real estate "It's a catfish recovery (lots of bottom feeders)". * "MRSA superbug found in milk in the UK. Consuming dairy not a worry." Yeah, I think I'll let you test that theory first. Watch for jobs numbers in the morning. The consensus is falling (probably around 140k by tomorrow), but I'll take the over even though I think it will be a strong headline with weak supporting data. The stock market took it on the chin yesterday (after an unexplained melt up the previous day) on fears about Europe - this is not a repeat of every other Wednesday for the past 12 months - and weak ADP numbers. On the ADP data - I've been arguing for years that this is perhaps the worst piece of pseudo information the market looks at. Their numbers have virtually no correlation to the actual jobs data and when everyone starts jumping ship over ADP numbers I'd be willing to bet the other side of that equation (namely the BLS jobs numbers to be released tomorrow) may surprise on the high side. Banks have spent the past 24 hours drastically cutting their expectations for tomorrow's number but as I've said before many, many of the BLS jobs are either new business start-ups and government positions, both of which don't show up in ADP data (although local governments have been cutting jobs recently). I'll have to see where consensus falls but my guess is that there is a fairly strong chance the BLS number tomorrow might beat expectations. We'll have a chance to debate the validity of that number tomorrow but I think the headline may look surprisingly good relative to the ADP data. Here's the next problem for the Fed: QE2 is planned to wind down at the end of this month. This is the end of the free money gravy train for the banks and that means things could get dicey for the stock market. The Fed can't justify any further easing (the much rumored QE3 is said to be DOA) with the stock market within a whisper of it's all-time highs, but if stocks fall without the Fed backstop what does that say about the value of Fed easing? The Fed has painted itself into a corner here and I don't see an easy way out. If the stock market was just some number scrolling across the screen it would be one thing, but this has deep ramifications around the country. Here's one example: Let's say the market falls 20% from here - this would be a steep decline given corporate profits but sentiment can turn quickly. Well, every pension fund that is heavily invested in the market will now see the value of their assets shrink while their obligations continue to grow. How do they make up that gap? Well, they force their plan members to kick in more principle. For the local school district that might mean more money leaving the instructional budget (teacher cuts). A falling stock market also weakens consumer and corporate confidence. However, if the Fed keeps the market elevated on Hopium (Hope + Opium :) you are looking at higher inflation - $5 gas anyone? - and weaker consumer sentiment. Choose your poison. We're again at the lower end of the trading range for stocks over the past 4 months. They've gone up and down within this 1,300-1,375 range since the beginning of February. A sustained breakdown through 1,300 could really start gaining some steam but every test of that region has been bought furiously in recent months. We'll see if this time is any different. All long-time readers know how much I loathe the double talk that comes out of Washington and the "vote" on raising the debt ceiling was another fine example of politicians acting in their own self-interest. However, there was some value in that vote because Congress tipped their hand and showed exactly what they are all about --- self-preservation. You see, they didn't randomly chose to raise the debt ceiling by $2.4 trillion because they liked the sound of it. $2.4 trillion is almost exactly the amount of money the Federal government will need to survive until late November 2012 -- RIGHT AFTER THE NEXT ELECTION -- if tax receipts tumble and the economy sputters. Congress can only see things through the prism that is their next election. Consider why both parties want to push this issue out past 2012: If the Republicans win the White House and sweep Congress they'll increase the debt ceiling without batting an eyelash as they did repeatedly under President Bush. If the President Obama wins but the Republicans control Congress, the Republicans can go on the attack the day after the election "You see OBAMA wants to burden your great, great grand-kids with more debt". This is a win/win for the Republican spin machine (in their eyes - the American public still loses). If Obama wins and the Democrats somehow ride his coattails back to power in Congress guess what happens? The debt ceiling gets raised again and no one outside of the talk radio nutjobs will notice. If the Republicans sweep everything, the Democrats can suddenly act like faux fiscal conservatives and start screaming for spending cuts before extending the debt ceiling. I've said it before and I'll say it again, the finances of our country our too important to be managed by people that are constantly running for re-election. If we were serious about battling our budget woes we'd pull the power of the purse from Congress because neither party has your best interest at heart, they only see how it impacts them in the next election.